Blogs are an effective way to communicate with both prospects and clients. As an added benefit Search Engines love the steady stream of new content Blogs provide. You have an abundance of information you can and should be sharing with your clients and prospects. Blogs are an ideal tool to publish your information. Since they are generally categorized both by subject and date, it provides an easy way for your Blog readers to access the fresh information they are looking for. As an added benefit Search Engines love the steady stream of new and relevant content that a Blog provides. Of course for this to work effectively, the Blog must be part of your Web site, not a 3rd party solution using a different URL. That's where BANG! comes in. Our Blog system integrates with your Web site and becomes a part of it rather than an isolated island of information. New Blog posts will automatically be published on the homepage of your Web site and made available for visitors and search engines. Management of your Blog is easy. 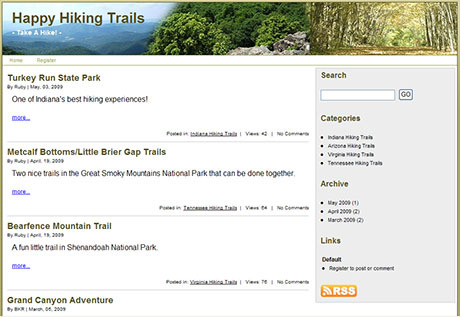 Just log into your administration area and choose your Blog from the menu choices. One login, familiar interfacces, we've made Blogging an easy and rewarding tool to achieve success. For a demonstation and discussion of how the BANG! Blog system can work for you Contact Us today.